In the early years of the Great Depression, thousands of unemployed homeless transients settled into Vancouver’s “hobo jungle.” The jungle operated as a distinct community, in which goods were exchanged and shared directly, without benefit of currency. The organization of life was immediate and consensual, conducted in the absence of capital accumulation. But as the transients moved from the jungles to the city, they made innumerable demands on Vancouver’s Relief Department, consuming financial resources at a rate that threatened the city with bankruptcy. In response, the municipality instituted a card-control system—no longer offering relief recipients currency to do with as they chose. It also implemented new investigative and assessment procedures, including office spies, to weed out organizational inefficiencies. McCallum argues that, threatened by this “ungovernable society,” Vancouver’s Relief Department employed Fordist management methods that ultimately stripped the transients of their individuality. Vancouver’s municipal government entered into contractual relationships with dozens of private businesses, tendering bids for meals in much the same fashion as for printing jobs and construction projects. As a result, entrepreneurs clamoured to get their share of the state spending. With the emergence of work relief camps, the provincial government harnessed the only currency that homeless men possessed: their muscle. This new form of unfree labour aided the province in developing its tourist driven “image” economy, as well as facilitating the transportation of natural resources and manufactured goods. It also led eventually to the most significant protest movement of 1930s’ Canada, the On-to-Ottawa Trek. 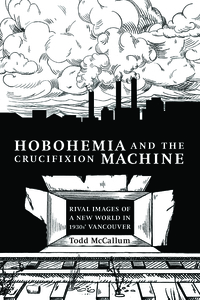 Hobohemia and the Crucifixion Machine explores the connections between the history of transiency and that of Fordism, offering a new interpretation of the economic and political crises that wracked Canada in the early years of the Great Depression. Todd McCallum is assistant professor in the Department of History, Dalhousie University.